I would like some “sound” advice please in preparation for and to successfully complete the Nine First Fridays and the Five First Saturdays. What are the requirements requested by Heaven? I personally do not know of anyone who has carried out these two requests fully, in my opinion, mostly from lack of knowledge that is not so easily available. We, who are privileged to live in a time that is predominantly devoted to the Sacred Heart of Jesus and the Immaculate Heart of Mary, need to draw down upon us the graces and blessings of these very special devotions. My children and I want to make a concerted effort beginning next month to do this, with the help of God, so that we can be better prepared for the coming chastisement, purification and our deaths. Once again, thank you so very much and may God truly reward you and yours for all that you are doing in His Holy Name. With my most sincere appreciation and many heartfelt prayers for all at Tradition In Action. Thank you for placing your trust in us to set out the conditions for the important devotions of the Five First Saturdays and Nine First Fridays. Here is the result of our research on these topics. The practice of the Five First Saturdays was requested by Our Lady to Lucia on December 10, 1925. Lucia was then a Postulant Sister in the Dorothean Convent at Tuy, Spain. On this occasion Our Lady appeared together with the Child Jesus, Who said to Lucia: "Have compassion on the Heart of your Most Holy Mother, covered with thorns, which ungrateful men place therein at every moment, while there is no one who makes an act of reparation to withdraw them for her." Our Lady then addressed Lucia with these words: "Behold, my daughter, my Heart encircled with thorns, which ungrateful men pierce at every moment by their blasphemies and ingratitude. Give me consolation, you, at least; and make known on my behalf that I promise to assist at the hour of death, with the graces necessary for salvation, all who, on the First Saturday of five consecutive months, confess their sins, receive Holy Communion, recite five decades of the Rosary, and keep me company for 15 minutes meditating on the mysteries of the Rosary, with the purpose of making reparation to my Immaculate Heart." 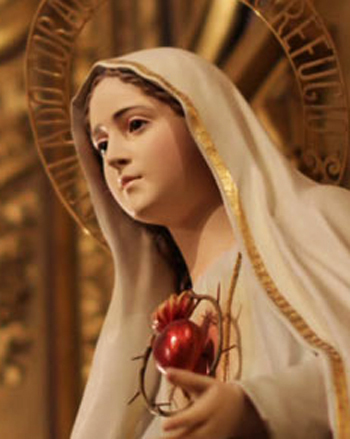 All the conditions above should be fulfilled with the intention of making reparation to the Immaculate Heart of Mary. On the occasion of the visit of the Christ Child to Sr. Lucia (February 16, 1926), she asked:"My Jesus, what about those who forget to make the intention?" He answered: "They can do so at their next confession, taking advantage of their first opportunity to go to Confession." On February 15, 1926, the Child Jesus alone visited Sr. Lucia and asked if the devotion to the Immaculate Heart of Mary was being propagated. Sr. Lucia spoke of a difficulty some people have in confessing on the first Saturday, and asked if they might be allowed eight days in order to fulfill Our Lady's requests. The Christ Child answered: "Yes, even more time still, as long as they receive Me in the state of grace and have the intention of making reparation to the Immaculate Heart of Mary." Therefore, one can fulfill the condition of going to Confession with an 8 day grace period before or after the First Saturday. Receiving Communion, saying the ‘terço’ of the Rosary, and meditating on its mysteries before a statue of Our Lady should all be done on the First Saturday. At the end of the 17th century Our Lord appeared to St. Margaret Mary Alocoque (1647-1690) and asked her to spread devotion to His Most Sacred Heart. They must receive Holy Communion; this assumes that the person is in the state of grace. 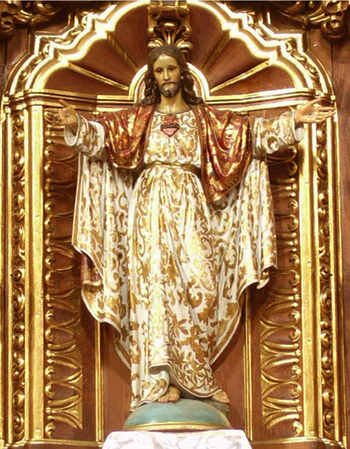 The communicant should have the intention, at least implicitly, of making reparation to the Sacred Heart of Jesus for all the sinfulness and ingratitude of men. I will give to devotees of My Heart the power of touching the most hardened hearts. These are the conditions I could find to precisely answer your question. I hope that now, you may prepare yourself and your family well to fulfill such requirements of Heaven.